Forever, lifetime living in your own healthy, comfortable and sustainable home: Designs by Charles M. Schwab. This home in Myrtle Beach was designed by Mr. Schwab. 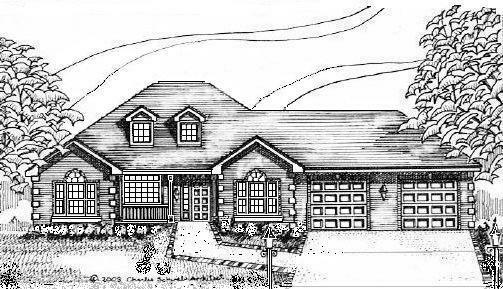 The above home is plan # UD 3390 on page 85 from the plan book. 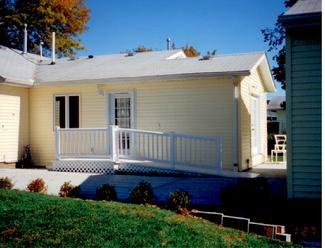 All of the homes designed by Mr. Schwab provide no step entries for easy access. This open plan bathroom alows for easy and independent use. 102 plan book front cover: all plans are designed for independent and healthy living. 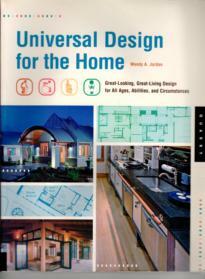 This is America's first universal designed and healthy home plans book. Plans can be ordered and built for your own home. The plans are fully accessible and usable for people of all ages and abilities and they can be modified to suit. I am glad to work with you to create your own custom home design and construction plans, while integrating your ideas along with the specific site requirements. The healthiest and most energy efficient homes are those that connect directly to your own property, orientation and neighborhood. A custom home design, based on the universal design process that I utilize, takes the principles of universal design as guiding design criteria. I often say, "the plans are a good place to start". I can adapt parts of a plan and layout from a plan in the book, adapting it into a home plan design specifically for you. 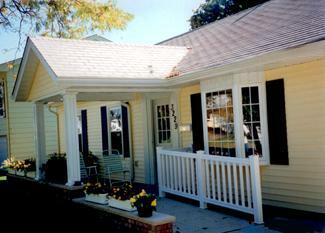 The plans are also helpful as a reference for remodels and home additions. The last 25 pages contain over 300 detailed tips and specifications that will be of great value to you whether you are building new or remodeling. I enjoy personal conversation or electronic communication if you prefer. Good communication is important for the success of every project. 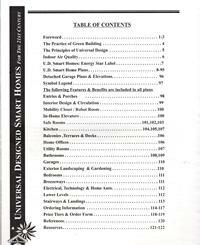 Universal designed smart homes for the 21st century, 102 home plans you can order and build. Click the Paypal button above to order a new book from Mr. Schwab. We ship only USPS priority mail. You may order a slightly imperfect book below. Click on the Table of Contents image above to enlarge it for a larger view.There are over 300 specifications and guideline items alltogether throughout the book. Over 30 Kitchen design tips and plan drawings for lifespan living are available in the plan book. Click the Paypal button above to order a slightly imperfect book. Inside in new condition or mild imperfection. Charles and Assoc. Nancy at a Philli. conf. book signing. 102 Plans you can order and build. 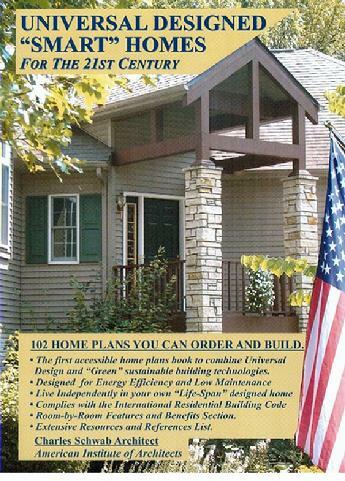 Order this innovative home plan and design book while we still have them. The same used book is selling at double the cost,and above on Amazon. When resellers say they are new, they all originated from this website. We have also received reports that there are contraband phony copies circulating as the binding is inferior. So purchase the real thing. I will also be happy to sign it for you at no additional cost if you wish. The cost here is only $97.95 plus $10.00 S&H. A new book costs $107.95 and up on amazon,but they are not "new" and are still second hand, as they all came from this site. We have also received reoports that some are pirated fake copies as the cover ink wears off. The originals here do not. We enjoy working with you to design remodels of all sizes. 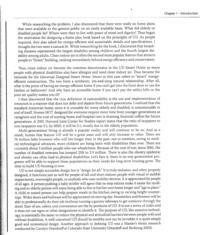 published Oct 2012 in PN Magazine proposes a universal design, home building and remodeling tax incentive idea that could save home owners and tax payers long term health care costs. 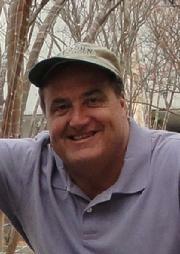 Please click this icon to read the Life Span Housing/Universal Design tax incentive article. Read the magazine article above on how billions of dollars could potentially be saved in the USA with a universal design tax credit. This would make possible, safer home healthcare and Aging in Place. "Universal Design In Housing is truly Sustainable as it will decrease the financial burden on future generations, when we build it".Charles M. Schwab Architect. Click on the text underlined below to listen to an interview of Mr. Schwab. It is 2 hours long. It is lengthy and I apologize for that but I think you will find it informative and interesting. 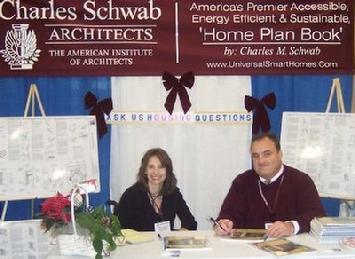 Interview Of Charles Schwab Architect on Blog talk Radio. Please click here to read the Harvard study. The universal designed home above was designed by Mr. Schwab for a family who has 4 children with mobility needs. It was completed in 2008 Bristal CT.
To learn about the definitions of Universal Design, Mr. Schwab's "UD and Accessible Home" Blog. Thank you for being one of almost five hundred and ninety one thousand people to visit this site. Please stop back often as I switch the magazine articles I show occasionally. 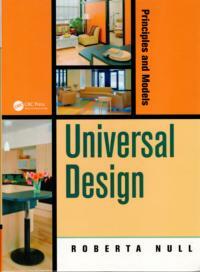 Special thanks to Roberta Null for inviting me to write her book introduction on Housing with Universal Design Principles. 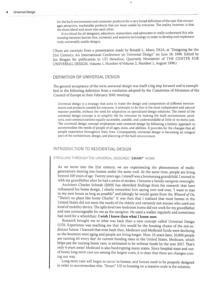 Please click image above to read the introduction to Universal Design in Housing. Special thanks to Wendy Jordan for including us in the book. You may also order from Amazon here. I will not reimburse the cost of the book (when you order a plan from the book) if you order from other 3rd party sellers on Amazon. I will however reimburse if you do order from me as the seller. My name is listed as the seller on the Amazon sales page, as you will see when you click to Amazon. I offer three options for the book re: condition and type. Thank you for in advance.